Founded in 1982, originally as CSC Graphite, our shop is located in Louisville, KY, central to the process and metal finishing industries. We maintain full manufacturing, repair and impregnation functions for low maintenance heat exchangers with high heat transfer rates in this facility. In many cases, our factory truck can pick up and deliver equipment within a few hours. 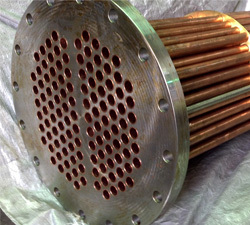 A heat exchanger is a device built for efficient heat transfer from one medium to another. The medium may be separated by a solid wall, so that they never mix, or they may be in direct contact. They are widely used in space heating, refrigeration, air conditioning, power plants, chemical plants, petrochemical plants, petroleum refineries, natural gas processing, military and aerospace, medical equipment, lasers, analytical instrumentation, power electronics, semiconductor equipment, machine tools, telecommunications, and more. What can a heat exchanger do for you?